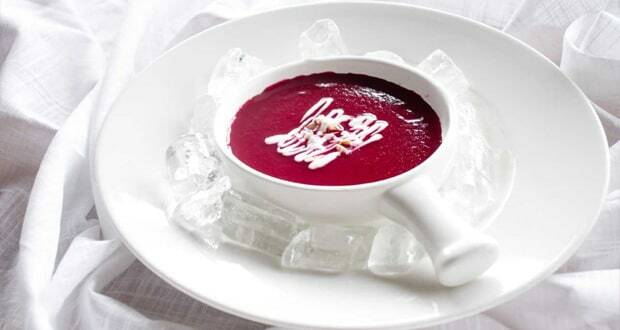 About Beetroot and Berry Cold Soup Recipe: Stir-fried beetroot and dry berries, cooked till tender, ground to a smooth paste with little of cranberry juice and chilled to a cold soup. A delicious soup recipe for the monsoon! 1.Wash, peel and slice beetroot. 2.Heat olive oil in a pan, add sliced beetroot and dry berries. 3.Stir fry it for 2 minutes then add juice and salt. 4.Slow flame and cook it till beetroot in tender. 5.Remove from gas and keep aside. 6.Grind it and make a smooth paste. 7.If it is thick then add a little cranberry juice. 9.Garnish with dry cranberry and sliced almonds.